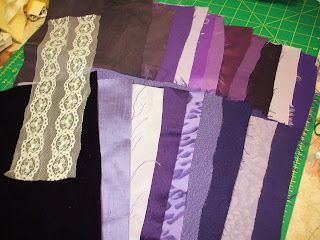 Photos and descriptions of recycled fancy fabrics for the crazy quilter. Hey Y'all. I didn't realize that it's been such a long time since I've even been in here. This past year has really been something for me and most of it wasn't pretty. ja ja ja. I'm only going to work on that stuff until 1p. Then it's push and shove to get everything ready for mailout tomorrow. 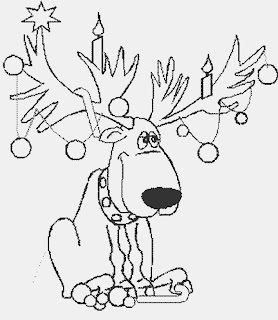 I love this little reindeer. 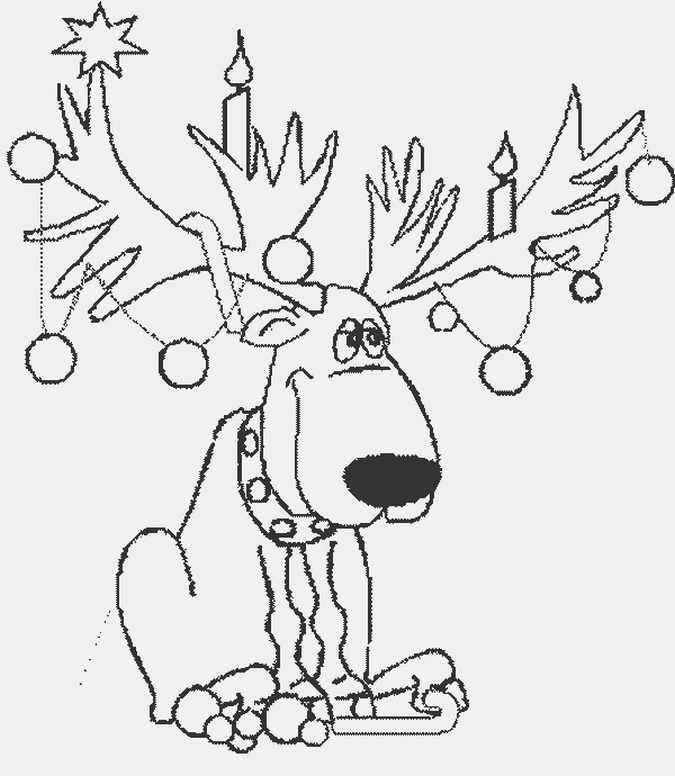 He is a free clipart so if you'd like to copy him and add him to your Christmas collection of patterns. OK, I'm off of here until I get that relish's veggies chopped and all that stuff. She wears tangled dresses of multicoloured petals. She has delicate pale pink wings like a cicada." Need a last minute gift? Wanta play Secret Pal or Secret Santa? Let me know and I can get some fabric baggies in the next working day's mail. I have 25 count baggies washed, cut, ironed and ready to mail in Red, Blue, Purple, Pastel, Brights and med/darks. These are recycled pieces of Thrift Store Fancies. They include silk, velvet, rayon, satin, acetate, sometimes lace and linen. These are $10.00 plus postage. Also have 25 count baggies in assorted linen weights and colors. A lot of the gals like using the linen which makes it easier to maintain even stitching. Plus, give me a couple days and I can make up "Christmas baggies" consisting of 25 count of reds, greens and golds, (or your choice of colors) 6 10 yard wraps of assorted matching threads, 2 funky fibers, gold buttons, Christmas charms, and whatever else I can find to toss in. (Sorry, I have no silk ribbon.) The fabrics in this offer are the same as listed above. This is a generous baggie and one that you can give with pride. The price for this assortment is $25.00 INCLUDING Postage! I have gathered up LOTS of fancy garments over the last 6 months and can make up some interesting baggies to order. Just tell me what you want and when I get it pulled, I can send you a photo for your approval. We're just so happy. Miss Donna has made room next to her sewing machine for us. We can help her sew. We're good at that. We just wish Crazy Judyth would hurry up and put us in the mail. She made some comment about dressing us up and washing our faces and.... WE don't think any of that needs done. Just get us there. We're so tired of living in a box! Thank you, Miss Donna, for offering us a good home. Help, We really need a good home! Hi. 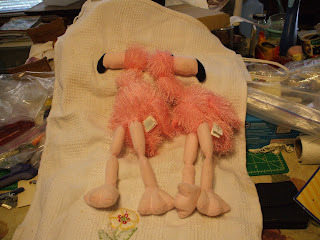 We're Flamingos that this kind lady saved from the trash at the Thrift Store where we were abandoned. Once we were Marionettes but that mean girl cut off all our strings. We are still very lovable and would like to go to a good home. The very kind lady who saved us just can't keep all of us. Her husband can't handle all the dust so she's trying to thin stuff out. All she asks is help with the postage. Would you please think about taking us into your home? Postage money is a problem with her right now even tho it can't be much. Thank you for looking at us. You can contact her at: judythnks@fairpoint.net. I love beading. I have gobs and more of different beads. I also have books on beading. 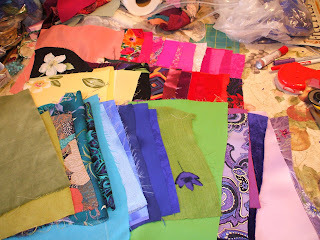 As I'm not doing much stitching............. why keep all of these? C. 2002, 130 pages. New, never read. ...Four basic foundation stitches and their variations are illustrated in careful detail, and useful tricks of the trade abound for developing pattern and image. Stanley Levy, this copy reprinted 2004. A Guild of Master Craftsman Publications. Slight shelf wear. 124 pages. Softbound. In this book Stanley Levy encompasses his many years spent perfecting the art of bead and sequin embroidery and will appeal to anyone with an interest in this creative technique. Full color Illustrations, helpful diagrams and photographs, the book progresses from the fundamentals to more advanced techniques. $10.00 US shipping including postage. Hardbound, book in good condition, dust cover mended. 144 pages. C. 1994. New: $27.95. Now $15.00 including US Media Shipping. New: $27.95 Now: 18.50 including US media postage. This is one I should keep. Skinny Sis came down Monday and spent the night. We sorted and culled lots and lots of stuff. I even took her upstairs..........the dreaded dark and cold dungeon that I don't let just anybody enter. For one thing, I have this OC about cardboard boxes. Big ones, little ones, tiny ones and I save them. All of them. So, consequently, the upstairs has a fair sized collection of empty boxes. Don't ask me why I save cardboard boxes. I can't answer you as I haven't a clue. But, Sis was a huge help in sorting things around. I have so much "stuff". I'm working on "grab bags" that will have lots of goodies in them. Watch for my ad on those. I'm going to start this with listing some books that I've collected over the years. They all are sewing/embroidery related. But not necessarily listed in order. I'm not going to upload pics of these. If you want one, I'll send you a pic. 1975 edition. Hardbound w/dust jacket. Book in good+++ condition. dust jacket has small tear at the top that I taped. 160 pages. Quoting from the dust jacket: "41 Patchwork Quilts with wonderfully evocative names--"Mariner's Compass," "Grandma's Garden".....--and legendary stories to tell". 12 Applique Quilts in whimsical, delicate designs such as 'Whig Roses,' 'Lotus' and 'Plume'. " US shipping only at $15.00 including media postage. Published 2004, Interweave Press. Soft cover. Good++++ condition.130 pages "Paint your Creative Visions with a Needle and Thread." This book appealed to me as it called out to the Individual in me. I hate structure in all things. Some great ideas which stirred my creative self. US shipping only at $15.00 including media postage. 50 Extraordinary Gifts & Projects, Step by Step. Published 1996 by Crown Trade Paperbacks. First American Edition. Slight shelf wear. Soft Cover. "This innovative book offers fifty beautiful and creative ideas for making gifts and projects from fabric." "Techniques include Cartonnage. Bead work. Scrapscrafts.Weaving. Stenciling. 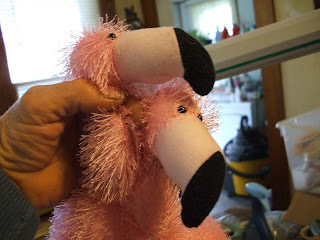 Felting. Stamping. Marbling. Applique.and Quilting." 160 pages. $15.00 US shipping including postage. This is taking a little longer than I thought. I'll be back to list some more this evening.